It was a wet stormy day in the Tetons as we looked for spots to shoot. We came across this little pond just off of the highway just as there was a short break in the rain. The wet conditions made the colors rich and saturated and storm clouds really made the sky dramatic. 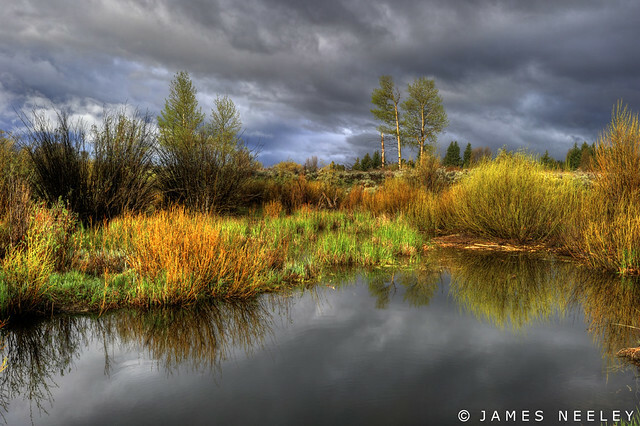 HDR can enhance a scene like this by darkening the sky and giving more detail to the reflection and other dark tones. However if we are not careful, the tonemapping can remove black and dark tones from the image making it much less pleasing and dramatic. Check out this tutorial to see how to restore this vital element to improve your HDR images.